MasterVoices and Orchestra of St. Luke’s/Ted Sperling; Ed Harsh: concert adaptation; Ludwig Lewisohn, William A. Drake, Charles Alan, Kelley Rourke: English translation; Noam Sheriff: additional orchestrations; Anthony Dean Griffey: the Rabbi; Mark Delavan: Abraham/Moses; Ron Rifkin: the Adversary; Eli Tokash: the Thirteen-Year-Old Boy; AJ Glueckert: Jacob/Boaz/David/Isaiah/Hananiah; Lauren Michelle: Rachel/Soul of Moses/Naomi; Megan Marino: Mariam/Ruth; Justin Hopkins: the Dark Angel; Philip Cutlip: Joseph/Solomon/Jeremiah; Michael Slattery: the Voice; Sean Fallen: Angel #1; Jose Pietri-Coimbre: Angel #2. In the opening notes to the monumental Der Weg der Verheissung the 1934 ‘epic theatre piece’ by Kurt Weill, Ed Harsh who has produced this concert adaptation under review talks of the “long road travelled” by what might easily be construed as Weill’s magnum opus. The Road of Promise evolved from a 1999 production of what was then called The Eternal Road. I venture to call it an ‘epic theatre piece’ because there seems no other title – certainly no other one-word title such as ‘opera’ or ‘musical’, or ‘pantomime’ that would fit, much less describe its form and content. Even in this substantially reduced adaptation by Harsh, The Road of Promise captures both the monumental conception of Kurt Weill as well as librettist Franz Werfel’s gripping narrative. The only strain on the listener’s ear, perhaps is the absence of the extraordinary visual aspect of this particular version as it was performed live in May 2015 at Carnegie Hall by The MasterVoices and Orchestra of St. Luke’s, founded by the legendary conductor, Robert Shaw seventy-five years ago. However, Navona Records’ aural document produced by Bob Lord will have to suffice for now; impeccable recording that it is, until we might be treated to an audio-visual presentation on DVD. Going out on a limb, though, Ed Harsh has done a remarkable job of adapting the epic and this extraordinary dimensions of this Biblical excursion is superbly performed by the MasterVoices and Orchestra of St. Luke’s under the direction of the ineffable Ted Sperling. 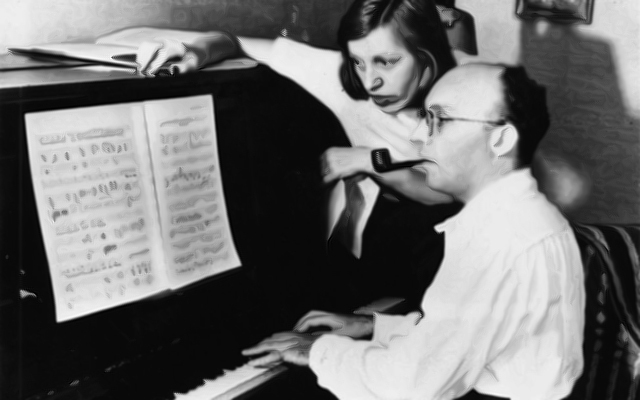 It was never easy for Kurt Weill and Franz Werfel in the first place. The sojourn begins with the promise made to the Great Patriarch, Abraham (Genesis) and his descendants through Isaac, Jacob and Joseph followed by the gathering of the Israelites under Moses (Exodus) through to the founding of the Hebrew kingdom under the Great King David (Samuel 1 and 2) down to the foundation of the Temple (Kings) continuing through to the time of the Great Messianic Prophets (Isaiah and Jeremiah. If that sounds like a daunting task for the creators Kurt Weill, Franz Werfel and Ed Harsh it really is. Not just because it means compressing the history of several thousands of years into a matter of a few hours, but because Weill saw the journey scripturally as well as idiomatically. And in doing so he conceived of a musical form that was to predate what Andrew Lloyd Webber (and Tim Rice) made hugely successful in contemporary times. 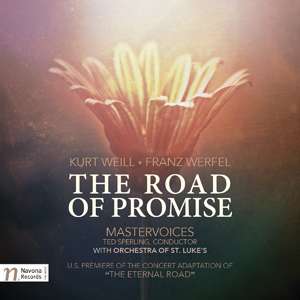 The Road of Promise is a series of fourteen interconnected episodes that clearly bring to life Weill’s vision that was born of his Jewish faith and heightened by the Nazification of Germany during the 1030s. But in many ways his 1928 collaboration with Bertolt Brecht for Die Dreigroschenoper (The Threepenny Opera) had already shaped his futuristic bent of mind and so it is hard not to be tempted by the idea that in the final episode, entitled “A Vision” attributed only to The Voice is not only how he imagined a present-day protraction of a Road of Promise might take shape not only in musical terms but also reflected in the idiomatic “Promise”. This delirium is brilliantly captured by Michael Slattery as “The Voice”. Like the 1999 staging, this version of The Road of Promise is not a romantic reading. Anthony Dean Griffey, Mark Delavan, AJ Glueckert and Michael Slattery deliver narratives with fury and power, with Philip Cutlip sounding especially noble and large-sounding in every role he is asked to play. There is not dearth of spectacular talent among the other performers. Eli Tokash’s turn as “the Thirteen-Year-Old Boy” is born of immense understanding of and ability to communicate his complex texts at every moment. Ron Rifkin is truly cruel and unforgiving as “the Adversary” as well. Best of all, Ted Sperling’s musical direction takes the listener up into the fly galleries of the theatre the better to picture the dramatic narrative as it unfolds, layer upon layer; throughout most effective in picking up on detail and nuance from the darkest moments of “Sacrifice of Isaac” to the bittersweet entry into “The Promised Land”. The most mystical moments come – as mentioned earlier – in “A Vision” where Slattery is inexhaustible and moving in his interpretation of the ‘promise’ of the future – once again – to put a finer point on it – literally as well as figuratively. Label: Naxos of America Inc.